(Nanowerk News) Just like in human civilizations the birth rate in the Universe fluctuated over time. When the Universe had reached 2.5 Billion years of its current age of approximately 13.8 Billion years, galaxies produced the majority of all stars ever formed. An international team of astronomers has now vastly improved on previous estimates. The Karl G. Jansky Very Large Array Telescope in New Mexico (USA) allowed to undertake a survey of distant galaxies that produced unprecendentedly detailed and deep radio views over such a large celestial area ("The VLA-COSMOS 3 GHz Large Project"). As opposed to opical light that our eyes can see, radio light is not blocked by the large clouds of interstellar dust that often reside in galaxies. This means that radio waves can be used to detect newborn stars within galaxies in a way that is not possible at other wavelengths of light. The VLA-COSMOS project started with Dr. Eva Schinnerer at the Max-Planck Institute for Astronomy Heidelberg as principal investigator already back in 2004 with a first radio survey of a celestial area called "COSMOS“. The tremendous scientific success of this project motivated the team – now led by Prof. Smolcic who at that time was based as a researcher at the Argelander-Institute for Astronomy at the University of Bonn – to apply for a large follow-up survey. This effort only became possible thanks to a major technological upgrade the Karl G. Jansky Very Large Array (VLA) Telescope in New Mexico (USA) had undergone in the meanwhile. The astronomers combined the new radio data with optical, infrared, and X-ray information from many of the world’s leading telescopes. "The synergy of sensitive, multi-wavelength data allowed us to investigate the properties of galaxies shining at radio wavelengths out to about 13 billion years into the universe’s past," said Dr. Alexander Karim who is responsible for the VLA-COSMOS survey at the Argelander-Institute for Astronomy at the University of Bonn. The team found that the rate of production of new stars within galaxies was the highest when the universe was about 2.5 billion years old – a fifth of its current age. During that period, about a quarter of all newborn stars were being created in massive galaxies. They also found that up to 20 percent more star formation was occurring in galaxies in the early universe, compared to what was previously thought. Moreover, a very distant but vigurously star forming population of galaxies – so called submillimeter-galaxies – were found to be substantially larger than previously expected. The exact reasons for this have not been entirely clarified yet but they could be linked to collisions and gravitational interactions between galaxies. The new radio survey has also provided a unique insight into galaxies containing actively growing supermassive black holes in their centers. 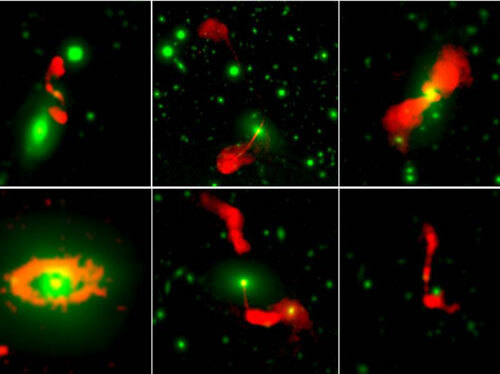 These galaxies are called Active Galactic Nuclei, or AGN for short. Matter orbiting around and falling into the black hole can release huge amounts of energy. Using the new radio data, the astronomers discovered more than 1000 AGN. Only their radio emission signatures betray their hidden black hole activity. They are particularly interesting because of their influence on the fate of their host galaxies but even on their cosmic environment. The astronomers compared the AGN heating process assumed in cosmological simulations to what they detected in the new radio data. They found a strong similarity between the two. "Physical processes associated with emission from these supermassive black holes may heat the gas in and around the galaxy, preventing the formation of new stars and halting the runaway growth of galaxies", says Dr. Schinnerer from the MPI for Astronomy in Heidelberg. Dr. Karim adds: "The VLA-COSMOS survey marks an important milestone on our way towards the next generation large area sky surveys."